Each year, one or two new cartridges steal the SHOT Show. This year, the accolade falls to Winchester, who kept things pretty well under wraps until Industry Day on the Range in Boulder City, Nevada. There, with 40+ MPH winds sending dust storms through the desert, shooters pulled the trigger for the first time on the .350 Legend. The sole platform to chamber the new rounds is Winchester’s budget-friendly XPR bolt action line of hunting rifles, though more platforms are sure to join the fray. Three types of ammunition will be releasing simultaneously with the rifles. 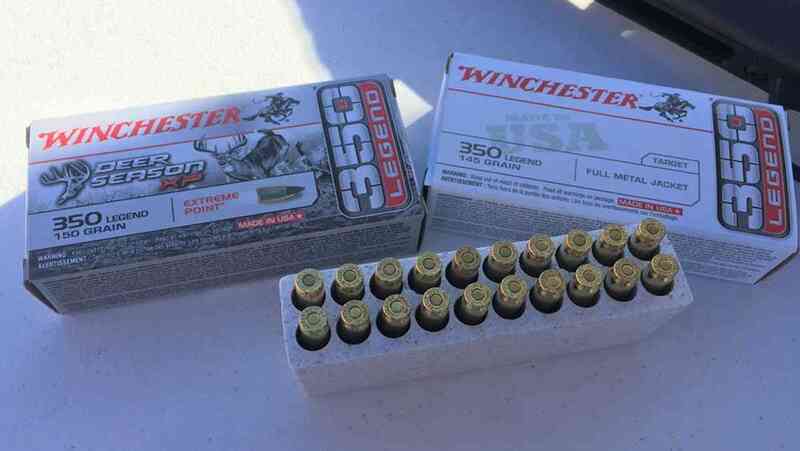 Naturally, these are all Winchester-brand ammunition, and they include: 145-grain FMJ Target rounds, 150-grain Deer Season XP Extreme Point, and 180-grain Power Point. 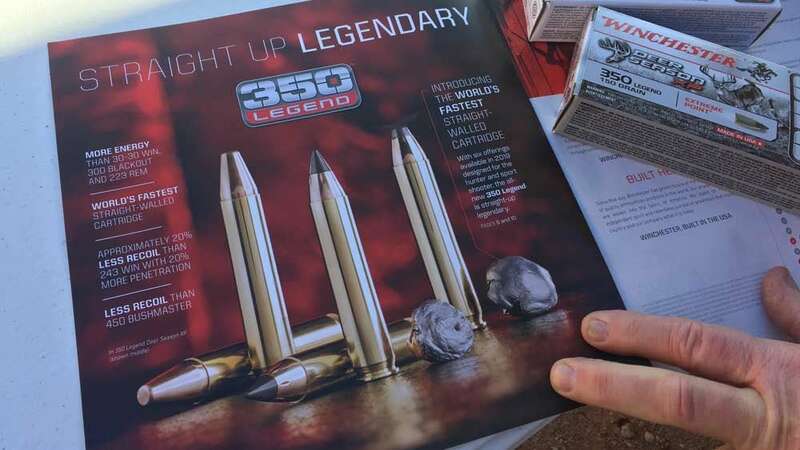 While cost is often a prohibitive factor with new cartridge announcements, ammunition for the .350 Legend should be affordable, with FMJ’s slated to sell for $9.99. The straight-walled .350 Legend immediately piques the interest of hunters, as it will be legal in 47 of 50 states with its design. The true straight wall is not necked up and would make it the fastest straight wall cartridge on the market. The bullet diameter is .357 inches with a shell case length of 1.71 inches. The XPR’s are available in a variety of finishes, but those shown off at Industry Day on the Range were black synthetic. While the caliber fires with low felt recoil and was punching out bullseyes at 200 yards, we thoroughly enjoyed firing one of the suppressed XPR’s in .350 Legend. Though there were no subsonic loads, the FMJ’s performed very well and recoil felt comparable to a .243 or less. Both the rifles and ammunition are slated to begin shipping in mid-to-late first quarter of 2019 at prices on par with XPR rifles of already existing calibers.